The traditional misperception of the brain as infinitely complex perpetuates unfounded credit towards it when rationalising behaviours. Participants compare their strategy in retrospect to that of mathematical capability of a computer. That is, the participant is not capable of mathematically computing rapidly enough an interception point, thus explaining their failure to live up to a clear predictive strategy. “If only we could realise the full potential of our brain.” Nonsense. The fallacy of the brain as the pinnacle of biological evolution, is used as a norm and blamed in an explanation of failure. It is thus perpetuated in every aspect of rationalising, but not for the observable behaviour. If you have a doctrine that constantly explains failure on the same terms, both a priori and a posteriori, there is good reason to examine it even closer. Observable behaviour is supposed to be the basis of assumption, indication and generalisation. I propose that traditional psychology does not. I propose it solely deals with antecedent assumptions and consequential rationalisation. Behaviour is only a means to the end of perpetuating the doubtful conclusions already postulated in the assumptions. There is a strong need for reinvention, to say the least. Author Patric NordbeckPosted on April 7, 2013 Categories cognitive psychology, psychology, representationalismLeave a comment on Nonsense. Well well, this is how far I’ve come in trying to visualise the whole tree of concepts in the modified version of rECS (Chemero), with additions from Golonka & Wilson and myself. 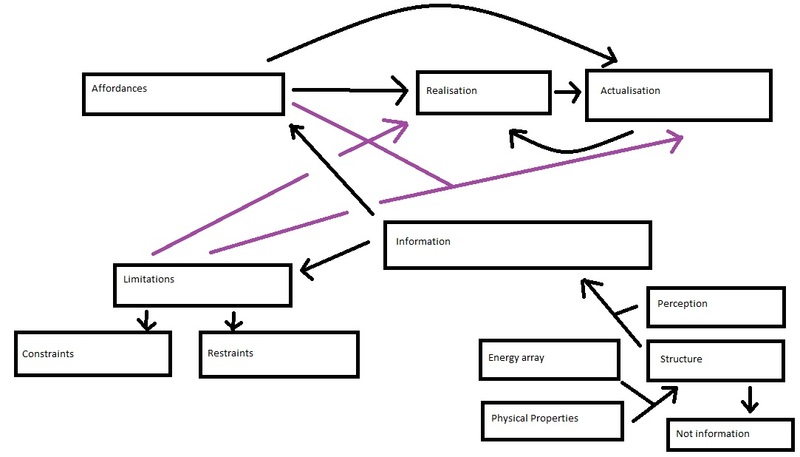 Starting out in the bottom right, with energy array and physical properties, it is worth mentioning that an energy array also could be said to be physical properties since we are talking about for example visually, light particles/waves. They are separated due to their function. Energy array + Physical properties give rise to Structure. Structure, non-perceived, is not information. Structure + Perception give rise to Information. Information give rise to Affordances of the object/agent and the Limitations. Limitations + Affordances can be Realised and/or Actualised. Affordances can be Realised and/or Actualised (without the need of perceiving Limitations). Affordances can be Realised which can give rise to Actualisation. Affordances can be Actualised giving rise to Realisation. These are not static one-way relationships, change in one, changes the others down to Perception. 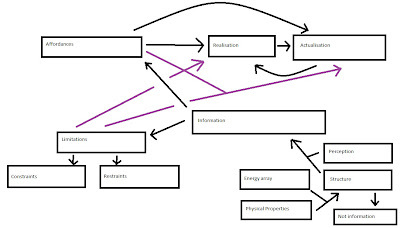 Practically, there should be arrows from Affordances, Realisation, Actualisation, Limitations, Information and Perception, to each other.. My MS Paint skills need a bit of retouching for that to happen. I am on my way of separating out all the concepts one by one and link them to their implicated and or necessary concepts. This is meant as a simple overview. Watch this space as I will try and post a new blog post each day (roughly) for each concept. Ontology deals with questions concerning what entities exist or can be said to exist. Proposed rule: An ontological definition of affordances cannot include, in full or in part, a relationship between two entities, if we wish to adhere to a realist account of said concept. Reason: Relationships imply mono-dependence or co-dependence. Reasoning: An ontological definition of a concept including a relationship, implicates ‘mono- or co-dependence’ with ‘what exists’. Conclusion A: then, there will be situations where either will not exist. Conclusion B: then there will be situations where neither will exist. Consequence: If affordances are in full or in part defined ontologically as a relationship, then affordances will align itself with idealism, since we will have situations where one or both entities do not exist. I am collecting my readings on Mendeley, in a group called Embodied Cognition (should be the only one so far..). I figured I needed somewhere to collect all readings I go through, however, since I have yet to find a way to add books to the group, and thought I may as well put them here in case anyone else has any utility for it. Will update the post as I’ve read articles/books etc. Also, please feel free to comment with additional readings that you’ve found valuable in understanding EC. Only read articles available on Mendeley. Books available on loan, from me, if you fancy a visit to Lund, Sweden, otherwise they’re available in bookstores online. Note on bias, prediction and utility from a Critical Realist perspective. We all live by strong biases, egocentric, in the sense that we have only a first person perspective from our own standpoint (assumption 1 & 2 and there are plenty more where those came from! Also, egocentric is used without judgemental value in this context). Naturally, we can observe and evaluate, sympathise and empathise with others but my argument does not revolve around the observer’s perspective. Rather, it is about the ‘data’ given, that which is worked from, from the egocentric individuals’ perspective. In real life (IRL for my fellow computer-geeks), we assume, interpret and justify actions of others and oneself (most oftenly) in response to situations, actions and relations. While I could turn this OP into a discussion of awareness and applied criticality to one’s preceding actions in a specific situation which would affect it and account for parts of one’s response-actions -it is beyond the scope of this specific piece (nevertheless very interesting). The issue is that we are not good with assumptions of others’ behaviour -even folk psychology requires more than one perspective to account for a situation and these are most often generalisations beyond justification. We are subject to environmental influences in decision making, intraindividual bias both from biological limitations to attention, interpretation and retention and from previous experience, anecdotes, interindividual bias from differing norms depending on who you are interacting with and lastly a cognitive bias in which we reinterpret, change, remove and add information in retrospect to a given situation (this is, by the way, not an exhaustive list of our phallacies). Psychological research on the subject of bias is overwhelmingly in favour of our poor ability to accurately account for situations and others’ part in it, let alone our own involvement in the situation (excuse the lack of references, what I have in mind is mostly eye-witness and implicit priming research). Indeed it is a central reason as to why we are told to write dispassionately and technically when presenting our experiments. It has several important consequences; the first is that it forces one to distance oneself from one’s own interpretation (if one is given) and secondly, the observer (the reader) is given a value-free account of someone’s interpretation of their data. This contributes to allow the viewing of an experiment critically, without having to be bound to criticise the discourse itself for bias. An example would be selective portrayal of results, choosing to present only results supportive of one’s hypothesis when there are other parts of it that would speak against or support a null hypothesis; this is a bias not controlled for by writing dispassionately, but, it becomes much clearer to the reader if this is what the author has done. It is thus a safeguard, but does not guarantee, against portraying instead of presenting and is the best way we have been able to come up with. So far. This is to me reason alone why reliance on accounts from only a few individuals is worth very little as basis of understanding for social phenomena, in scientific discourse. It does have worth -and can have worth to others- but all too often the consequences of which are overlooked or not mapped out. For my own private empathy/sympathy register, it is fascinating to be allowed entry into an individual’s world -a perspective one would not have unless one was either a member of the same group or the individual oneself. It fosters understanding for something I previously dismissed or was ignorant of. One gains a larger perspective -but(! )- only in the realm of one’s own assumptions and cognising when observing social phenomena from one’s individual, private/personal, view of the world. It also adds another bias to one’s framework; new assumptions are made upon the limited perspective of this, one, or a few individuals -which does not necessarily account for other “similar” individuals. Understanding social phenomena is a different thing when we are discussing the basic scientific principle of prediction (and its utility). Scientific research demands predictability and an unspoken assumption is for it to have utility, i.e. the consequences of any prediction must aim to explicate and elucidate a proposed relationship -it must hold without our intervention/involvement/observation of it. This prediction is then evaluated for its utility by how well (or not) the proposed relationship predicts a future social phenomena. We assume there is a mechanism by which an observed action is caused but we are well aware of that, because of our biases and limitations, we may perhaps only come as close as these biases and limitations allow us. We have however still an excellent way of understanding how close we actually are to explaining ‘what actually happens’ because of the consequences of our prediction’s implementation. If X then Y. X. Y? Y’? 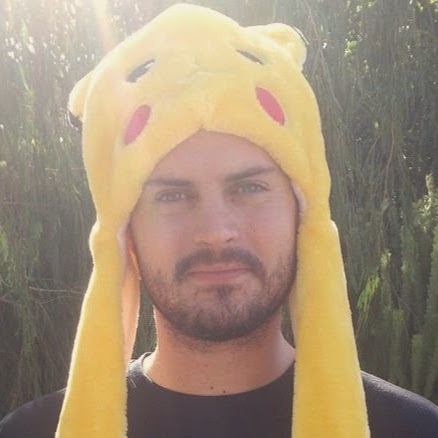 Y”? Z? While social phenomena are far from as simplistic as an X and Y relation, social scientists are creative in testing these predictions -sometimes they lead us down a garden path, sometimes they reveal more or less solid predictions. The point is, of all the assumptions made in this OP, being aware of one’s shortcomings is a crucial way of both understanding why one’s research showed the results it did (regardless if it fits or not with what one _wants_ to find), communicating a _needed_ skeptic perspective, guides one to see potential bias in others’ research as well as leaves one open to (and happy for(!)) criticism from others. We cannot afford to ‘believe in’ our theories and hypotheses, they introduce a bias that can be veiled by scientific discourse and very concretely limits a potentially wider/better (in regard of predictability) perspective of a social phenomena. Author Patric NordbeckPosted on April 13, 2012 Categories account, bias, critical, individual, observation, observe, perspective, philosophy, prediction, psychology, realism, utilityLeave a comment on Note on bias, prediction and utility from a Critical Realist perspective. There was a solution posted in a recently started blog by Matthew Lieberman that focuses on direct/conceptual replications. His solution is indeed a very interesting one; add to the curriculum of graduate students in their first or second year that they replicate findings of studies previously nominated to be so. While comments on it are pessimistic (with justified reasoning), I do hope it resonates within the scholarly psychology community. A personal take on Lieberman’s response is that I probably would not have minded to see this added to my own curriculum. I may not be all too pleased but considering how much one would learn by replicating something that has worked before, I may not be too peeved about it. Also, getting a name on a publication would be a pretty sweet bonus. Of my severely limited insight into other universities ‘caring and nurturing’ of aspiring scientists, some are better (and some worse) in picking up their students and involving them in the ongoing research. Maybe Lieberman’s idea would go a decent amount of the way to attenuate this issue as well. Ed Yong’s initial coverage* of Doyen’s** and Bargh’s*** study was, in my opinion, quite brutal. I have been taught through my undergraduate to criticise constructively and I do not think the initial post has the depth to do so. For example, a close look at Doyen’s study indicates that one of the few last alternatives at explaining participant’s slower walking speed was experimenter expectation (and a very well conducted piece of research to demonstrate it). The difference in the walk-fast/expect-fast condition was explained by the difference between manual and automatic measuring, not so in the walk-slow/expect-slow condition. I wrote this in my previous blog entry too, but with a different emphasis. This finding means that an environmental stimuli (experimenter expectation manifested in subtle behaviour) was internalised by the participants and subsequently affected observable behaviour (walking slower). This entails that the Doyen study, in fact, supports the original proposition of the Perception-Behaviour Link. This mitigates my criticism of Bargh’s work, since, the theory from which he based his 1996 experiment was conceptually replicated in the Doyen study. The PBL is not mentioned in Ed Yong’s initial coverage. In Ed Yong’s reply**** to Bargh, he mentions Doyen to “[have] timed volunteers with infrared censors rather than a stopwatch” But they timed both with sensors and manually. This was one of the central reasons that they came to the conclusion that experimenter expectation was the only alternative left to explain their result. It does strike me from having reviewed large parts of the literature surrounding priming that the published articles are all conceptual replications. The studies following Bargh et al. (1996) have differences in methodology to that study. The issue that has been raised in comments to Bargh’s reply to Ed Yong is that “purer” replications that have not given the same results are subject to the file-drawer phenomenon. I.e. publishers have not accepted them and so they’ve been put in the file-drawer. The issue with this statement is obviously that it is very hard to know (for an outsider like myself) if publishers have denied these studies because they show null-results (not very exciting and from comments it seems there are other rather valid reasons for them not to publish these) or if they contain errors of various types (making them unpublishable). In either case, I believe I argue in my literature review, strongly, for the theory underlying priming (the Perception-Behaviour Link) but at the same time believe that researchers are getting ahead of themselves and testing advanced hypotheses, when really what this theory needs is the grunt-work of establishing even its simplest tenets. Be that an actual replication of the methodology in Bargh et al. (1996), even though I believe there exist other research more suitable to exemplify the Perception-Behaviour Link. I should have chosen another topic to do my 30-page literature review on.